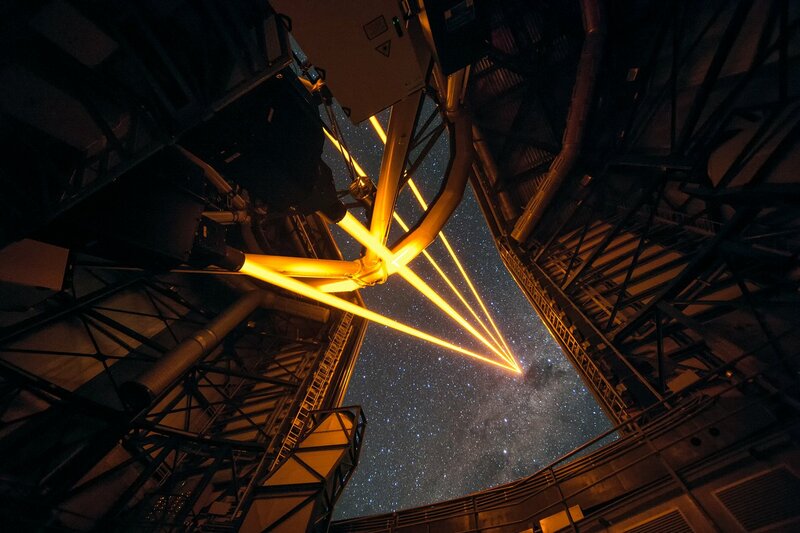 The pioneering work of ESO’s Adaptive Optics Facility (AOF) team has been recognised by the Optical Society (OSA). The AOF team have been awarded the 2018 Paul F. Forman Team Engineering Excellence Award. They received the OSA prize during the Frontiers in Optics (FiO) + Laser Science (LS) Awards Ceremony held on 17 September, in Washington DC, USA. 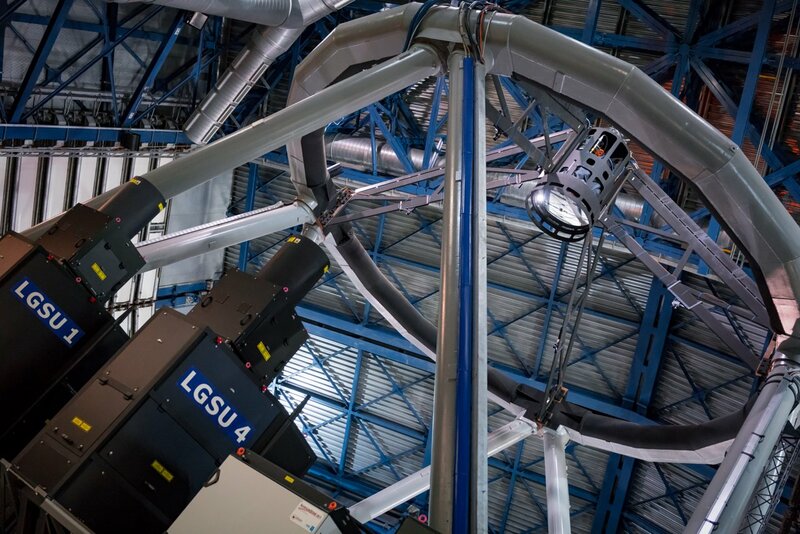 The team was awarded the prize for equipping Yepun, the 8.2-metre Unit Telescope 4 of ESO’s Very Large Telescope, with Adaptive Optics. The AOF was a major project to improve the vision of the Multi Unit Spectroscopic Explorer (MUSE) and the High Acuity Wide-field K-band Imager (HAWK-I) instruments by providing them with the ability to compensate for the blurring effect of the Earth’s atmosphere . The precise and complex engineering behind the AOF has now been recognised with the Paul F. Forman Team Engineering Excellence Award, which was received by Elise Vernet, Johann Kolb and Robin Arsenault on behalf of the AOF team. The award is presented yearly to celebrate the highest technical achievements or contributions to society in the field of optical engineering and has previously been awarded to engineering teams working on groundbreaking projects like the Advanced LIGO experiment, which was famously used to detect gravitational waves from colliding black holes and neutron stars. The engineering behind ESO’s telescopes has previously been recognised by this prestigious award. In 2017, the Guide Star Alliance received the award for the production of high-power guide star lasers (SodiumStar). 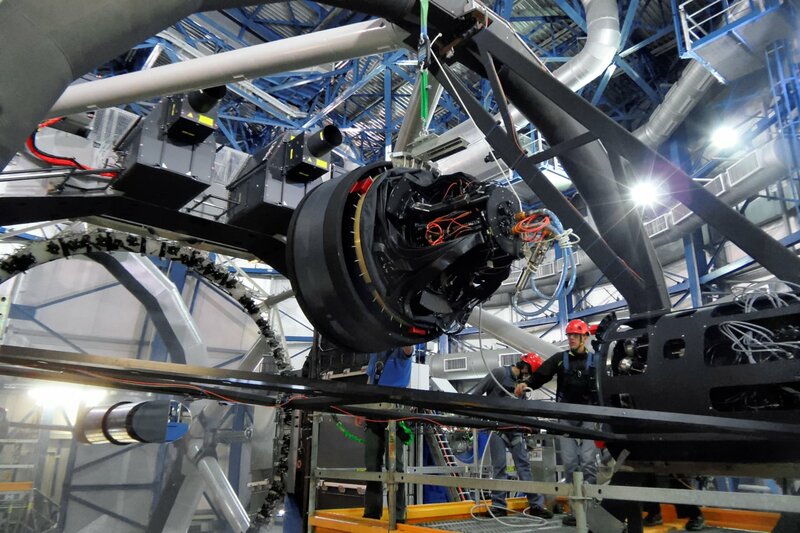 The SodiumStar was the outcome of an industrial partnership between ESO’s AOF team, TOPTICA Photonics, and MPB Communications (MPBC), and has been recognised as a core technology for the next generation of ground-based telescopes . Through this prime example of pioneering engineering, the AOF team has equipped astronomers in ESO’s Member States with an invaluable tool to explore the universe. Furthermore, the experience gained by ESO engineers will prove vital in overcoming future engineering challenges, such as building the Extremely Large Telescope — the world’s biggest eye on the sky. The AOF is composed of many parts working together, including the Four Laser Guide Star Facility and the very thin deformable secondary mirror of UT4. The 4LGSF shines four 22-watt laser beams into the sky to make sodium atoms in the upper atmosphere glow, producing points of light on the sky that mimic stars. Sensors in the adaptive optics modules GRAAL and GALACSI use these artificial guide stars to determine atmospheric conditions and the corrections required to improve image quality. One thousand times per second, the AOF system adapts to atmospheric conditions by changing the shape of the telescope’s Deformable Secondary Mirror to compensate for atmospheric disturbances. This requires coordination between many different subsystems and is what allows the AOF to provide MUSE and HAWK-I with such exquisitely sensitive vision. Other industrial partnerships have also been instrumental to the success of the AOF. Microgate and ADS delivered the Deformable Secondary Mirror, an integral part of which is the 1.1 m thin shell mirror produced by SAGEM-REOSC. NTE Sener delivered the GRAAL opto-mechanical system and TNO produced launch telescopes for the Four Laser Guide Star Facility. NOVA made major contributions to the ASSIST bench used to qualify the AOF in Europe, and the MUSE consortium, as well as providing a state-of-the-art instrument, helped qualify the performance of the AOF.